Update: The Sir Robert Bond Papers has written a response to this post here. In 2007, the PC party of NL introduced a $1000 bonus for women who give birth or adopt a baby. The Sir Robert Bond Papers blog has recently run a series of posts analyzing the effect of this policy on birth rates, concluding that the effect has been small and temporary. There are a few problems with his analysis though, so I'd like to add to this discussion. Firstly, his analysis considers only the number of births per year, which fails to account for changes in population and demographics. A better indicator is the fertility rate: the average number of live births a woman can expect in her lifetime based on age-specific fertility rates in a given year. Secondly, his analysis doesn't acknowledge that declining birth rates is a trend nation-wide and that provincial rates should be compared to what is happening in other provinces. The following chart compares NL fertility rates to Canadian fertility rates. The rates are per 1000 women so a rate of 2000 means that the average woman will have 2 births in her lifetime based on that years stats. This shows that fertility in NL is consistently below national averages, but has jumped much closer in recent years. The timing of that jump is easier to see by charting the difference in fertility rates by year. The jump happened in 2008, the year after the new policy was enacted. Moreover, the difference has actually narrowed since then. Now I'm sure that the booming economy has a lot to do with this, but the data is entirely consistent with the PC baby bonus having a significant and enduring effect. It is interesting to consider how fertility has changed among different age groups of women. 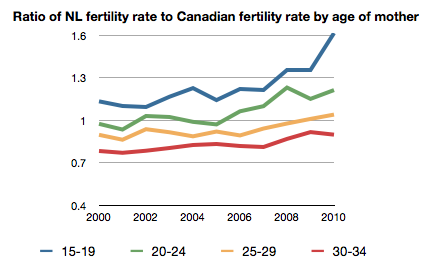 In the next chart I show the ratio of the NL fertility rate to the Canadian fertility rate by age of mother. 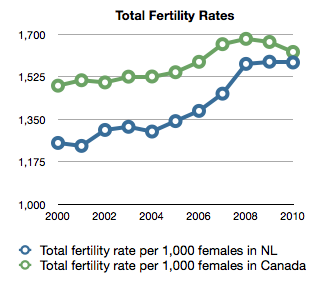 From this chart we see that women in NL tend to have children earlier in life than the Canadian average. 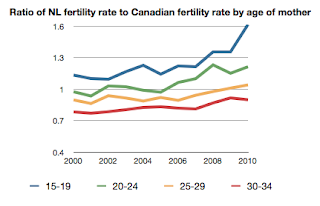 We also see that fertility rates in NL have increased relative to Canadian averages for women of all ages, and that the effect is most pronounced among young women. This is more clearly captured in a table. 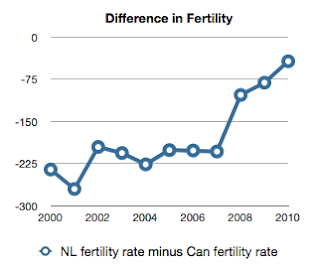 NL fertility rates relative to Canada have risen about 10% among women over 25 years of age, but have risen twice as much among women under 25. Is the baby bonus driving up the teenage birth rate? I don't think this is a policy outcome that most people would support. Maybe we should change the policy so that $1000 bonus only goes to adult mothers. What do you think?